Suffolk detectives are investigating the destruction - the second attack on St. Lawrence the Martyr Church's Nativity scene in a span of two years - as a possible hate crime. 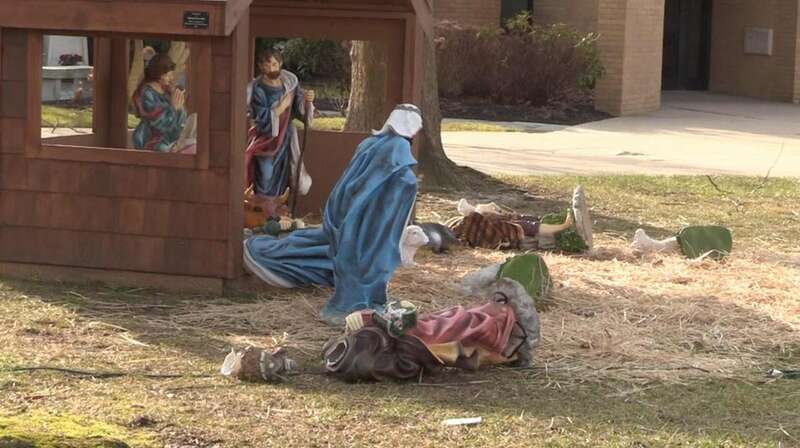 An outdoor Nativity scene was damaged at St. Lawrence the Martyr Church in Sayville, possibly on Thursday night or early Friday morning, Suffolk County police and the church's pastor said. 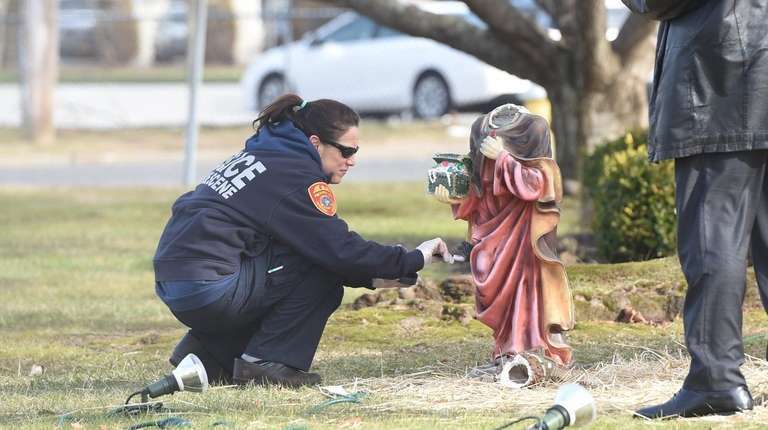 Suffolk detectives are investigating the damage — the second attack on the church's Nativity scene in a span of two years — as a possible hate crime. The Rev. Brian Ingram, the pastor, said the vandalism against a symbol of the Christmas season had taken an emotional toll. "I certainly feel a sadness that some people or persons, whether they are young or older, would have such disregard for not only a display that's not their own but also something that is really quite precious to the community here at St. Lawrence," he said, adding that the church is spiritual home for 3,700 families. He is not certain whether the damage is a result of animus against the church or a mischievous prank, the pastor said. "I certainly have no way of reading the heart or mind of the person or people involved," Ingram said. "My gut instinct is it has more to do with mean spiritedness or people who are just looking to vandalize property because it’s a very easy target being so close to the road." The display is set on grass just a few yards from busy Montauk Highway. As many as four figures were toppled over from the scene, which is about 6 feet tall and 12 feet wide, Ingram said. Two figures showed considerable damage, including one statue of a human whose head had been separated from the body. Photographs from the scene show statues, possibly shepherds who might have encircled the manger — where the baby Jesus still lies, surrounded by the Virgin Mary, an angel and Joseph — lying on the ground. Police inspected and photographed the scene on Friday. The church is the same one that had Nativity items stolen from it two years ago, a theft that was investigated as a hate crime. No arrest has been made in that case, police said Friday but Ingram said one of the purloined items was returned anonymously. "I realize that things like this do happen at many different places," Ingram said. "It's frustrating that it's happened to us more than once and we are going to have to consider other options in terms of where to place it in the future." Also unsettling, Ingram said, is the fact that the scene might have served as a soothing image to pedestrians and motorists who could see the lighted statues in the evenings. "It's something that brings a lot of pleasure to a lot of people who are walking by, driving by in the midst of a hectic season that can give people a reminder of the real meaning of what the time is about," he said. Because of the incident, Ingram said, the display will be removed in a day or so, though church leaders had planned to remove it after Jan. 13 to close out the Christmas season.